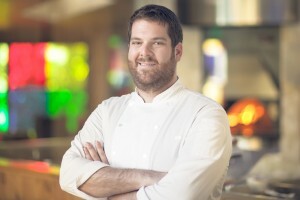 Chef Micah Wexler trained in some of the best restaurants in the world, but last year when he took the helm of Mezze Restaurant in his hometown of Los Angeles he raised the bar for Jewish cuisine with his Middle Eastern menu that incorporates new variations on some of his favorite foods growing up, like brisket braised in pomegranate juice. (The man also makes a mean challah). 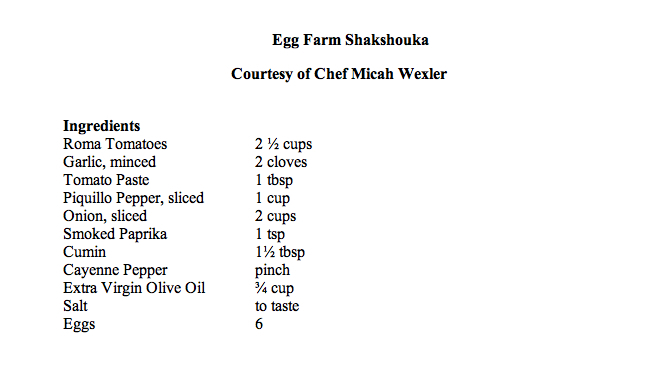 With Passover around the corner we asked Chef Micah to help us get creative with the holiday, and he offered us a recipe based on Mezze’s Egg Farm Shakshouka. Try this recipe instead of scarfing down over-boiled salted eggs while waiting for the ritual meal. Or wow your girlfriend with this Tunisian-style dish for brunch post-Seder eve. You could also make Micah’s shakshouka as breakfast for dinner during Passover—or any night of the year. Note: If you don’t have a fryer or food mill, just use diced fresh, peeled tomatoes. You can also replace the Piquillo peppers with roasted and peeled bell peppers. At Mezze Micah serves this dish with sweetbreads; If you are so inclined: dust some salt-soaked (for a day or two) nugget-size sweetbreads (ask your butcher to clean them for you first) with matzoh flour and pan fry for a couple minutes per side. Add to cooked shakshouka and serve. 1. Put whole Roma tomatoes in the fryer just until the skin is blistered. Discard skin and process tomatoes in a food mill. 2. In a large pan sauté onions and garlic in a copious amount of oil until lightly golden. Add peppers and spices and let cook another 3 minutes. 3. Add tomato paste and cook until rust colored. 4. Add tomatoes and allow everything to simmer for about 40 minutes. 5. Crack eggs directly into the stew and allow to poach until the yolk is similar to a sunny side up egg. Serve directly in the dish the eggs were cooked in with some matzoh to sop up the stew. As I am new in passover, I just love the egg farm shakshouka. You can take a look at this passover message: goo.gl/lFsMZ on this celebration . Very unique one.